No wonder the editors praised Graham for being broad-minded and tolerant! He supported a worldly, foul-mouthed, womanising, New-World-Order-supporting, evil man whose governorship of Arkansas coined a new phrase, “Arkancide”. What about the diabolically evil former president, Barack Obama? 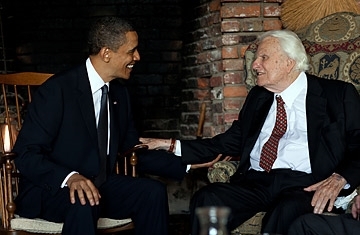 Naturally, he weighed in as well, saying: “Billy Graham was a humble servant who prayed for so many – and who, with wisdom and grace, gave hope and guidance to generations of Americans.” Note the utter lack of reference as to precisely who Graham was a servant of, and no reference whatsoever to the Gospel – something Obama is utterly ignorant of. Graham received President Obama at his own home in 2010, and prayed for him, his family and his administration. The worst president in American history, whose presidency was a greater disaster for America than even that of the crude womaniser, Clinton! A statement like this shows Trump’s own spiritual ignorance. Pence was raised a Roman Catholic, but has since claimed to be an “Evangelical Catholic”, or just an “Evangelical”. One thing is clear: for all his conservative ways, his words and actions have revealed that he is not a true Christian. But like politicians everywhere, he knows how to say the right things to attract voters. Graham’s death gave him (and Trump) just such an opportunity. And note how Pence “knows with absolute certainty” that Graham was received into heaven, having heard Christ’s welcome. On what would he base such certainty? On no biblical evidence whatsoever. And then there was this comment from Mitt Romney, former Massachusetts Governor and a Republican presidential nominee: “Billy Graham lifted eyes toward heaven and instilled heaven’s values in hearts. The world mourns this man of character, this man of God.” But Romney is a Mormon! A member of one of the largest cults in the world, a cult which believes that its god was once a man and that men may become gods. And yet he called Graham “a man of God”! When a Mormon praises an “Evangelical”, we know the biblical lines of separation have been completely blurred! But here’s why Romney could praise Graham so highly: when Romney ran for president, Graham’s organisation removed Mormonism from its list of cults! He was, at the very least, a deceived man, and a false preacher of a false gospel. But there is more to the Billy Graham story, as shown above: a sinister aspect, the evidence pointing to him being a deliberate, but clandestine, servant of the Papal Antichrist. Was he a Jesuit agent, or merely a tool in the hands of the Jesuits? Their tool he most certainly was, and a willing one at that who knew what he was doing for Rome – all the evidence given in this article, and much more besides, proves this beyond all shadow of doubt. But whether or not he was a Jesuit himself, acting under orders and pretending to be a Baptist minister, we do not know at this time, and we may never know. Either way, however, he did more to promote the false “gospel” of Roman Catholicism than any other “Evangelical” has ever done; and he promoted so many other false doctrines, sinful activities, etc., that no true Christian should ever, in any sense, hold him up as having been a great man of God – for this he most definitely was not. He served Antichrist, not Christ. And he did so knowingly, deliberately, and without any conscience about it. Shaun Willcock is a minister, author and researcher. He runs Bible Based Ministries. For other articles (which may be downloaded and printed), as well as details about his books, audio messages, pamphlets, etc., please visit the Bible Based Ministries website; or write to the address below. If you would like to be on Bible Based Ministries’ email list, to receive all future articles, please send your details. An exposure of the false doctrines and ungodly conduct of Graham: his relationship with Romanism, Communism, the WCC, etc. Billy Graham: Performer, Politician, Preacher, Prophet? by the Church League of America, Wheaton, Illinois, 1982. 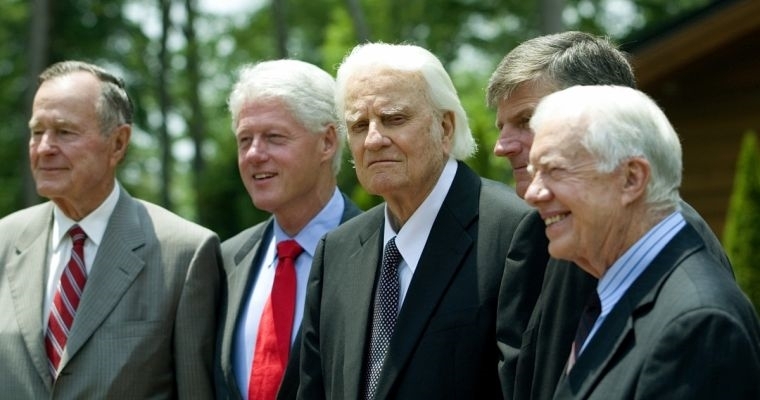 Billy Graham and His Friends, by Cathy Burns. Sharing, Mt. Carmel, Pennsylvania, 2002. The Pied Piper of the One World Church: Billy Graham, by Wilson Ewin. Josiah Publishing, Whitefish, MT, USA, 1996. Evangelicalism: the Trojan Horse of the 1990s, by Wilson Ewin. Bible Baptist Church, Nashua, N.H., USA. The Other Side of Billy Graham and Watergate, by F. Paul Peterson. Self-published, 1974.
. WND, February 21, 2018: “The Man who Preached Jesus to Billions.” www.wnd.com.
. Watch! January to March 1990. Published by the Christian Research Institute.
. Billy Graham: Performer, Politician, Preacher, Prophet? by the Church League of America, Wheaton, Illinois, 1982.
. See The Jesuits: the Secret Army of the Papacy, by Shaun Willcock. Bible Based Ministries, 2012. This book may be ordered from our website.
. Billy Graham: Performer, Politician, Preacher, Prophet?
. The Southern Cross, 30 July 1989.
. The Southern Cross, 13 August 1989.
. Email sent to Shaun Willcock by a correspondent in France, dated 23 February 2018.
. The Revivalist, June-September 1989.
. Chicago Tribune, June 8, 1963, as quoted in Billy Graham: Performer, Politician, Preacher, Prophet?
. See The Vatican Moscow Washington Alliance, by Avro Manhattan. Chick Publications, Chino, California, 1986.
. The Other Side of Billy Graham and Watergate, by F. Paul Peterson, pg. 59. Self-published, 1974.
. The Other Side of Billy Graham and Watergate, pg. 57.
. Billy Graham, the Pope and the Bible, by M.H. Reynolds. Fundamental Evangelistic Association.
. Billy Graham, the Pope and the Bible.
. The Catholic Times, Montreal, April 1990, as quoted in An Open Letter to Dr. Billy Graham, by Wilson Ewin, 5 May 1992.
. Christianity Today, February 24, 1978, quoted in Billy Graham and the Vegas Casino Christians, by E.L. Bynum, 1978. Tabernacle Baptist Church, Lubbock, Texas.
. See The Vatican Moscow Washington Alliance. .. Billy Graham: Serving the Papal Antichrist (MP3 or CD set), by Shaun Willcock. See the Bible Based Ministries website for ordering details.
. The Southern Cross, 28 January 1990.
. Christianity Today, October 28, 1991.
. ChristianityToday.com, week of April 4, 2005.
. Life Special Commemorative Edition, pg. 6; quoted in The Death of the Pope of Rome, by Ronald Cooke, pg. 5. Published by Ronald Cooke, Max Meadows, Virginia, 2005.
. Billy Graham: Serving the Papal Antichrist (MP3 or CD set), by Shaun Willcock. See the Bible Based Ministries website for ordering details. ..Portion of transcript of the interview between Larry King and Billy Graham, http://transcripts.cnn.com/TRANSCRIPTS/0504/02/lkl.01.html.
. Time, October 27, 1961; quoted in The Revivalist, June-September 1989.
. As quoted in An Open Letter to Dr. Billy Graham, by Wilson Ewin, 5 May 1992.
. The Protestant Challenge, 2003 Number 1, pg. 8. The Canadian Protestant League.
. Faith and Freedom, April-May 2015, pg. 10. www.faithandfreedom.com.au.
. Media Spotlight, Volume 25, Number 1, March 2002. Media Spotlight, Redmond, Washington, USA.
. Interview: Larry King and Billy Graham, April 2, 2005. http://transcripts.cnn.com.
. The Other Side of Billy Graham and Watergate, pgs. 70,75.
. The Perilous Times, Vol. 15, No. 12, February 1994. Berean Independent Baptist Church.
. The Perilous Times, Vol. 15, No. 12, February 1994.
. Letter dated 29 February 1968, by W.H. Martindale of the Billy Graham Evangelistic Association, and quoted in The Revivalist, June-September 1989.
. Way of Life, 4 June 2006. Fundamental Baptist Information Service, email article. www.wayoflife.org.
. Bible League Quarterly, October-December 2012, Issue 451, pg. 288. The Bible League Trust, United Kingdom.
. Media Spotlight, Volume 28, No.3, August 2005, pgs. 16,17.
. WND, March 2, 2018: “Millions Watch Billy Graham’s ‘Last Crusade.” www.wnd.com.
. Chicago Tribune, April 7, 1970, as quoted in The Billy Graham Compromise, by William E. Dunham. The Review of the News, May 8, 1974.
. Mainichi Daily News, May 28, 1973 (English newspaper published in Tokyo), as quoted in The Billy Graham Compromise, by William E. Dunham. The Review of the News, May 8, 1974.
. Christianity Today, February 24, 1978.
. Milwaukee Sentinel, October 19, 1991.
. WND, February 21, 2018: “Tributes to Billy Graham: ‘We are Now a Nation without a Pastor.” www.wnd.com.
. News from the Front, June 2010. “Take Heed” Ministries, Ballynahinch, Northern Ireland.
. The Burning Bush Online Archive, 12 March 2013.
. Christian Post, February 22, 2018: “Televangelist Benny Hinn Admits Going Too Far with Prosperity Gospel in Wake of Billy Graham’s Death.” www.christianpost.com.
. Gateway News, 23 February 2018: “Benny Hinn: The Church will Come Out of Hiding When Billy Graham Dies.” https://gatewaynews.co.za.
. Christian Post, February 27, 2018: “Rick Warren Says Billy Graham Inspired Him to Witness to LGBT, Muslims, Atheists Despite Criticism.” www.christianpost.com.
. Gateway News, 23 February 2018: “Billy Graham Dies at 99.” http://gatewaynews.co.za.
. Northern Ireland Springbok Club, 8 July 2005. Nispringbokclub@hotmail.com.
. Midnight Messenger, Issue 56, July-August 1994. Clackamas, Oregon.
. Midnight Messenger, Issue 56, July-August 1994.
. Newsmax, 18 October 2012. www.newsmax.com.